I’m a full-stack PHP developer from Moldova with 13+ years of experience developing a range of websites, including startup landing pages and complex projects. I’m technically skilled and adept at developing effective solutions and top-quality products. I started to work with Wordpress in 2007 and it became my main focus. During 10+ years I have gained valuable experience building complex custom themes and developing advanced features in WordPress. I work with both, backend and frontend, contributed themes/plugins, as well develop custom ones. Custom frontend & backend features. Converting non-WP sites to WP site. HTML templates to WP Theme. 2+ years experience of BuddyPress development. Creating & customizing BuddyPress-compatible themes using Buddypress Core API & Codex standards. BuddyPress Extensions Development using Core API & best coding practices. Integration of famous APIs, like Google API, Paypal, Facebook, etc. and more highly specialized APIs, like TeamSnap, TrustCodes, Coinmarket, etc. https://qpnorge.no/ – a web platform for connecting employers with employees. Profiles with a lot of fields, auto-generated CV in PDF, complex search with filters, messaging between users, groups, Facebook API (login/registration), Google Maps API, etc. https://ricubai.com – project management system. I've worked with Nael on previous projects and he's always a pleasure to work with. Very professional and had an excellent understanding of the project requirements. I would highly recommend him to anyone looking for custom development on their Wordpress site. Nael was great to work with. He understood our needs perfectly and finished the project very fast and without any issues. He communicated very well and was always immediately available if we had questions. We would definitely recommend him to anyone who has a need for custom development and plan to utilize his expertise in the future. Nael has extraordinary skills. The collaboration was seamless and the result immaculate. Codeable's collaboration platform is just perfect, from inquiry to receipt. Looking forward to another opportunity! Excellent work and timely communication. Thank you Nael! It was a pleasure to work with him and hope to hire him again in the future. The job was completed and I'm very happy! 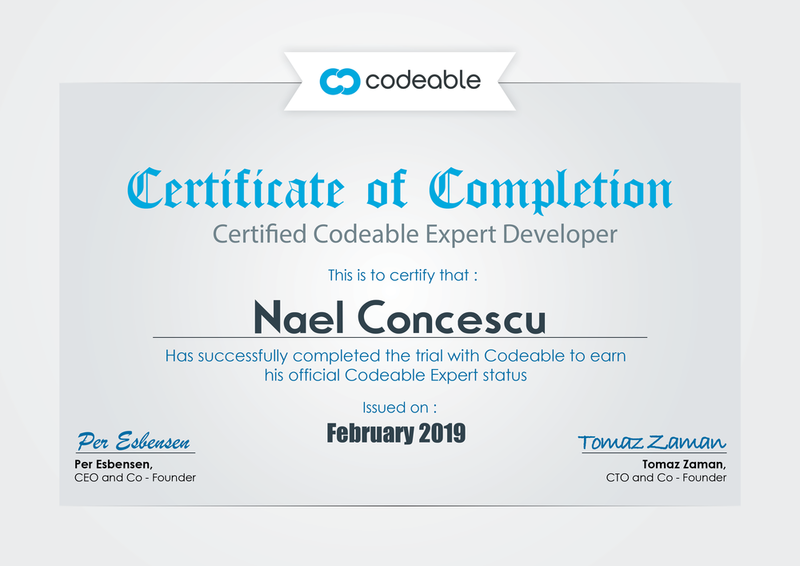 Nael completed all the tasks as expected, in the given time and providing great support. Great working with you Nael, I truly hope to work on future projects with you! Thank you. Very easy to work with and had a good understanding of what we wanted to achieve. Thanks Nael - It was a pleasure to work with you. Nael asked good questions before starting the project and delivered the results within a day.